I received product for review from Sweese. The opinions within this post are of my own and I was not influenced in any way. Please do your own research before purchasing products or using services. Your opinions and results may differ. I'm going to throw myself under the bus and admit I've never owned a proper butter dish until now. I either kept the butter in its original packaging or threw it in a bowl if I needed to put it out on the table. There's nothing necessarily wrong with that but I have to say that butter looks better in a dish suited for it. 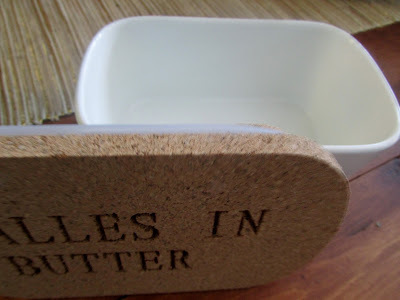 I received the Sweese 3101 Butter Dish for review and that's where my butter now resides. Admittedly, it looks better there. 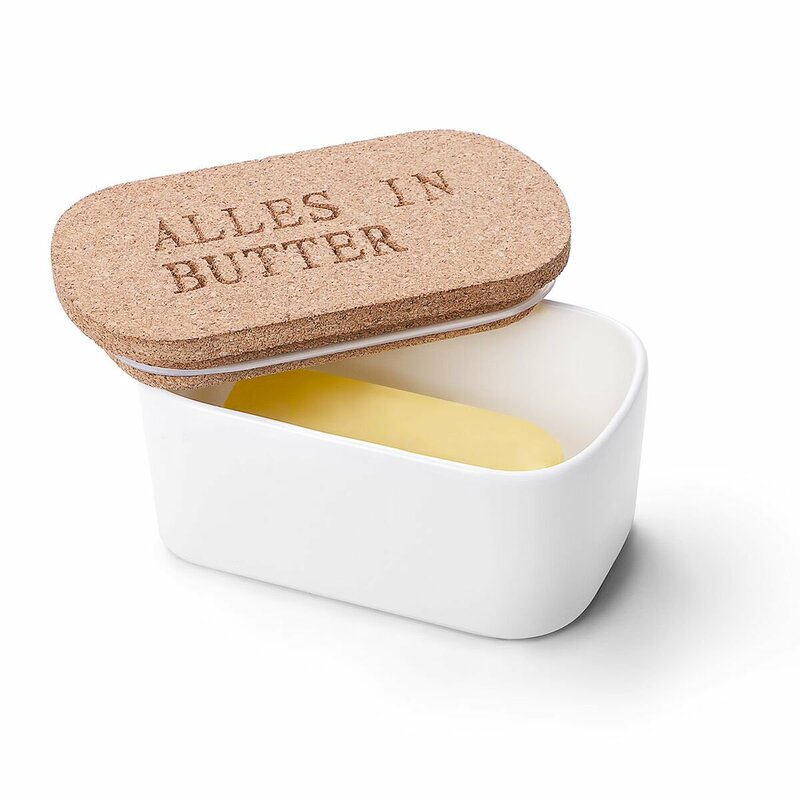 It also maintains the freshness and spreadable consistency of butter without refrigeration. 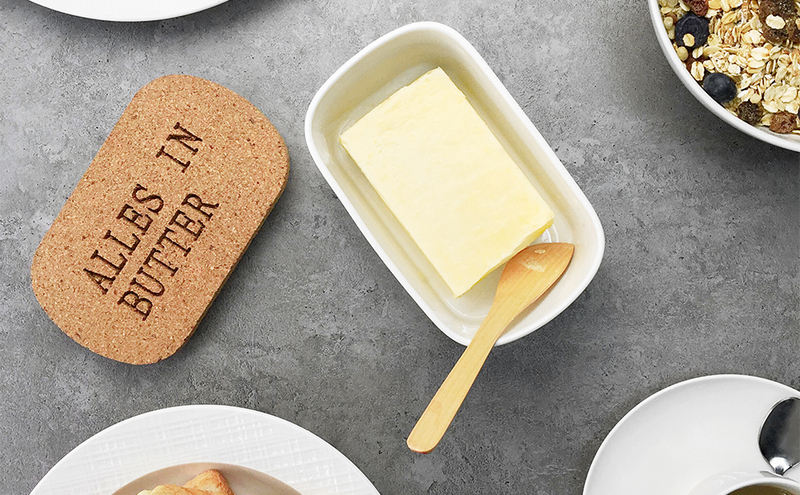 Serving butter to guests in the Sweese Butter Dish is a little more elegant than slapping it on the table in its original packaging. 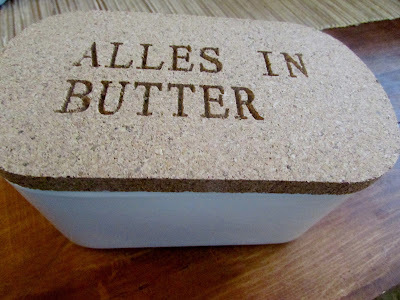 I was curious and did a Google search on the word "Alles In Butter". I'm still not positive what the phrase means but I did learn that Alles is a German word that means everything is fine or everything is done. The actual dish itself is made of white porcelain and the lid is made of cork material. The Sweese 3101 Butter Dish can be used in the microwave and freezer. You can wash the ceramic part in the dishwasher but the cork lid must be hand washed. The depth of the dish perfectly holds a stick of butter. It can even hold two if you choose. The cork lid has a silicone ring seal. You can keep the silicone ring on the lid if you want a very airtight sealed lid. If you just want the lid to sit on the dish, you can take the silicone ring off. It's a little harder to take the lid off with the silicone ring on it, but I prefer it that way. This is a nice, sturdy butter dish that helps keep butter fresh. One person will win a Sweese 3101 Butter Dish. Oh I have to top those biscuits with butter. Then the vegetables always taste better with butter too. Nothing like real butter. My boys love butter on their pancakes. Nom Nom! I like it on biscuits with a drizzle of honey. I love to cook with butter. I fry eggs, make popcorn and quesadillas. I use butter in baking cookies and I also put a bit of butter in when making mac & cheese. We love to top our baked potatoes with butter. I like almost anything topped with butter! A favorite is hot homemade bread topped with butter. Nothing is tastier than butter melting on a slice of fresh, warm bread. I cook eggs with butter. I like cinnamon toast with butter. I like to add a pat of butter to hamburgers when I cook them on the stove. I can think of many top one to cook baked potatoes oh my so good. Hmm, I think my favorite thing to add butter to is a big ol' baked potato, lol. Now, that would be good for supper! I love butter on everything, but especially drizzled over sunny-side up eggs that have fried in it. YUMMY! What don't I like to cook or top with butter..nothing. I love fresh sweet corn on the cob with loads of butter. I put butter, real butter, on everything. Leave a comment on this blog post with a food you like to cook or top with butter. I like homemade bread with butter. Toast, bagels, pancakes - everything's better with butter! We just had the first corn on the cob of the season slathered with butter of course! Butter is good on so many things. I love putting butter on baked potatoes, rice, halibut and especially scrambled eggs! Lots of vegetables are PERFECT with just a wash of butter! I like it on my steamed squash, and I LOVE it on sweet corn! I always add some butter to my skillet potatoes at the end of cooking them! I like to top my baked potatoes with butter. I love rice with butter and lots of salt and pepper. I do all my baking with butter. I would definately add butter to my baked potato ! I use butter melted on top of hot food items such as meats and vegetables and as a spread and to finish various sauces. I use butter when I bake from scratch! I love to put butter on toast. I like to butter buns and broil them before we have burgers! My family loves when i make fried corn. It doesn't get much beeyer than fresh cut off the cob corn and butter. My favorite is butter on still warm homemade caramel rolls! Butter really does make everything better. Grilled steak is best with butter to me. at this time of year, corn on the cob. I love butter on a fresh Pretzel. I love to make shrimp scampi with a top of butter. Would like to put butter on baked potatoes. I love broccoli and butter. Have to have butter for corn on the cob. I love butter probably a little too much. There is nothing like a roll and butter. However it is also goo on top of veggies and mashed potatoes and on chicken sandwiches. It's almost time for Silver Queen Corn. My mouth is now watering! I love butter on baked potatoes. I like to put butter on french bread. I love making my peach cobbler with a stick of butter!! buttered rolls and corn on the cob, nothing is better with butter! I love putting butter on my steak! I add butter to basically everything, my favorite is on mashed potatoes though. i love to butter fresh baked bread. it's the best. I love butter on corn on the cob and on fresh bread or rolls. I like to cook my eggs with butter. I like to cook lemon pound cake with butter. I love butter on my popcorn! And toast! Butter on homemade cornbread! Yum! I always cook with butter. I love to saute my steaks in butter and garlic and then mix in some mushrooms. I also love butter with any seafood. I like a pat of butter on my steak. Almost any steamed vegetable tastes better with some butter on it. I would like to make a great big t-bone steak with plenty of butter on top of it. i use butter on lots of things but especially on hot biscuits, OMG and some jam. lord i am drooling. Pretty much everything is better with butter! But I especially like fresh baked bread with good butter. I love whole wheat fresh breads and potatoes topped with real butter. I like to cook grilled cheese with lots of butter. I like butter on every kind of bread, especially when I bake my own.